Microarray Analysis Textbook, by Mark Schena, Ph.D.
Arrayit Microarray Store > Books & Software > Microarray Analysis Textbook, by Mark Schena, Ph.D.
Dr. Mark Schena, under the direction of Wiley Science Editor Dr. Luna Han, explores the full gamut of subject areas in biology's hottest field with vivid clarity and detail. 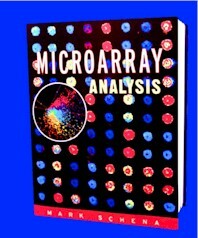 Microarray Analysis, the first textbook on the subject by the world's leading authority, will be available for the fall 2002 semester. Order now to guarantee availability for your fall classes! Chapter 16. Future trends: Chips in the clinics?